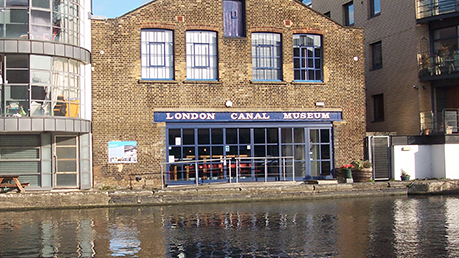 Discover the canals of London in a building that was built to store ice in the nineteenth century. Carlo Gatti, a Swiss entrepreneur, imported large quantities of ice from Norway by ship and canal boat and stored it underground in the two ice wells that are beneath the floor of the museum. Peer down into one of them and be amazed at Victorian ingenuity. Learn about the canals that carried all sorts of cargo, and the people who lived and worked on the boats, earning a meagre living and bringing up a family on board. Find out about the horses that pulled the boats and the ice carts, and try your hand at working a model boat through a lock. See the traditional roses and castles decoration of the waterways, explore inside a boat cabin and look at our tug Bantam IV outside on the canal. First Thursday of each month late opening until 19.30. Closed Monday except Bank holiday and 24 - 26 & 31 December.